The MotivAider is consistently one of our top sellers here at Different Roads to Learning. It’s a versatile and helpful tool that can be used for anything from prompting a child to engage in play to toilet training. 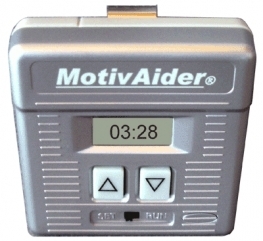 The MotivAider vibrates at timed intervals to prompt an individual to engage in a specific behavior. This is an interesting article about how it is specifically used with children with ADD. Have any of you used the MotivAider as a way to teach or change certain behaviors? How have you used it and for what? We’d love to hear your experiences. Written by: Different Roads to Learning on October 5, 2010. This entry was posted in Products, Resources and tagged ADD, autism, autism education, behavior management, developmental delays, developmental disabilities, Different Roads to Learning, fixed intervals, Motivader, motivating learners, prompts, schedules, students, teaching, teaching tool, teaching tools, toilet training, variable intervals by Different Roads to Learning. Bookmark the permalink.